The Beecher Community Library was begun in 1987 as a volunteer lending library sponsored by the Beecher Women's Club. A small collection was housed in the Beecher High School library. In June 1989, the Beecher Community Library moved to the upper floor of the Washington Township Community Building at 673 Penfield and shared the space with the Beecher Community Historical Society Museum. Membership was $10 per family per year. After a year of campaigning, a successful referendum (1212-183) was held in November, 1994, creating the Beecher Public Library District. The Beecher Community Library began operation as a tax-supported public library in August, 1996. Cynthia Hughes, who had just received her Master Degree in Library Science from the University of Illinois, was hired as the first Library Director. As the library expanded, Trustees began searching for a more desirable location. Many locations were considered and financing a new site posed a large hurdle. After four years of conservative fiscal budgeting, the Library Board had accrued $183,000 in the capital reserve fund. By generous donations from community residents, the total was increased to $250,000 and the Trustees applied for a matching grant from the Illinois Live and Learn Construction Grant program. The matching grant was awarded in March, 2000. 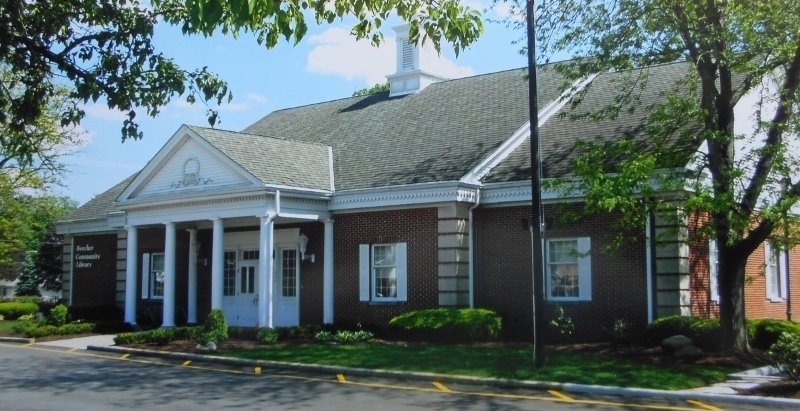 The First Community Bank and Trust property at 660 Penfield Street was purchased in December, 2000. After extensive remodeling, the Beecher Community Library moved into its beautiful new facilities in April, 2001. Dedication ceremonies were held on June 10, 2001. Upon the resignation of Cynthia Hughes in July, 2001, Joyce Horath served as Library Director until July, 2002, when Jennifer Young was appointed. Jennifer served until September of 2008. Carol Harris, the Assistant Librarian/Circulation Manager, served as Interim Director until Jill Grosso was hired in June 2010. Current staff as of January 2014 include Dawn Gess (circulation clerk), Sharon Grigas (library page/desk clerk), Celia Powers (circulation clerk), and Linda Stanevich (library page/desk clerk). Volunteers working at the circulation desk include Shirley Biery, Kathy Czarnecki, and Karen Nelson. Marilyn Rossler and Tim Czarnecki process all new books. All residents living within the Beecher Library District are entitled to a Beecher Community Library Card. Boundaries of the district are Offner Road (south side of road) on the north, State Line Road (west side of road) on the east, Country Line Road (north side of road) on the south and Crawford Avenue (east side of road) on the west.